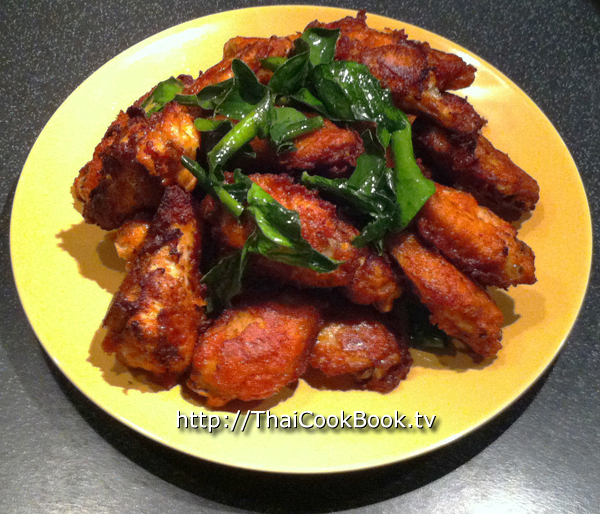 Worawut's Spicy and Salty Fried Chicken Wings, ปีกไก่ทอดเกลือ (Peek Gai Tod Gluea), are neither too spicy nor too salty. They are just right. He marinates the wings in a mixture that includes our homemade red curry paste, and then the wings are fried in a batter containing the same sauce, giving these Thai-style hot wings an amazing blend of flavors and aromas from fresh lemongrass, galagal, kaffir lime, and dry roasted cumin, coriander, and peppercorns. They are very easy to make up in advance, and are normally served at room temperature making them an easy party food or appetizer that your guests have probably never had before. What's in our Spicy and Salty Fried Chicken Wings. How we make our Spicy and Salty Fried Chicken Wings. 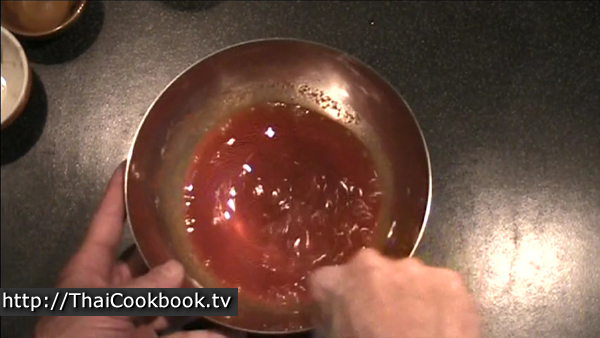 1) Whisk together 1 tablespoon of red curry with the water, oyster sauce, fish sauce, and sugar, and ground chili. 2) Poor over the chicken wings and marinate them for at least 4 hours. 3) Remove the chicken from the sauce. Add about 1 - 2 tablespoons of flour to the sauce and whisk it together to make a thin batter. 4) Lightly dust the chicken with flour, then dip them into the batter until they are well coated. 5) Fry in deep oil for 3 - 5 minutes on each side. Drain well. Top with crispy fried kaffir lime leaves. 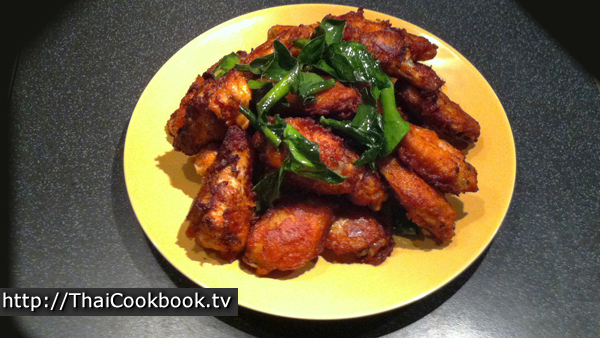 Your party guests will be drawn to the deep red color of these wings, and the contrasting green of the deep fried kaffir lime leaves are much more than just a simple garnish: They add to the overall rich Thai flavor and aroma from the strong red chili paste contained in the batter. If you can't find kaffir lime leaves in your area, don't worry. You can also quick fry ordinary fresh basil leaves they way we do with the kaffir lime leaves here. 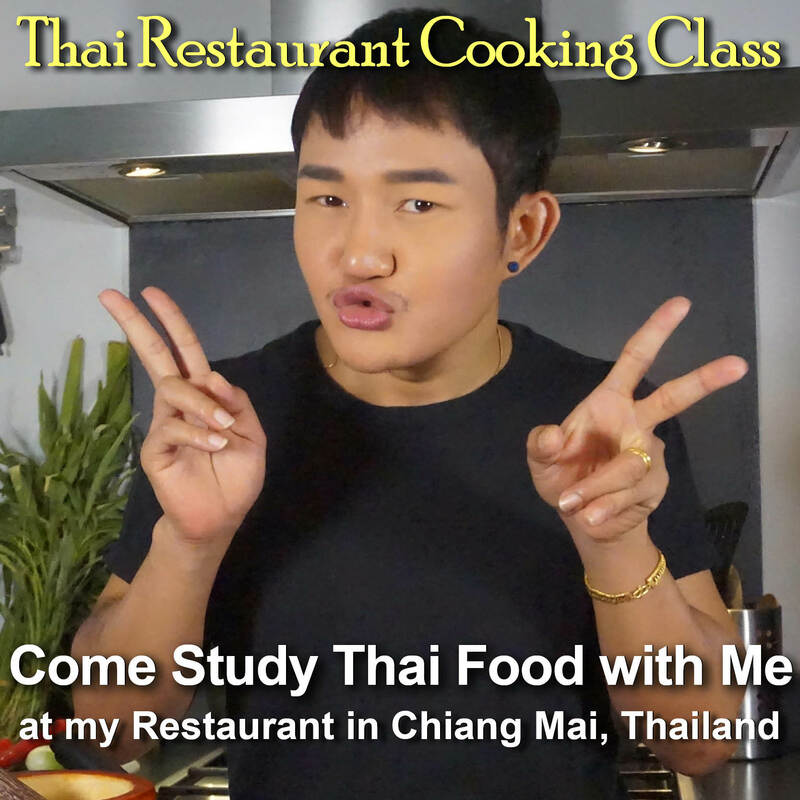 The flavor is different, but still very authentically Thai. I like to separate the center wing portion from the drumstick, but you can leave the wings whole if you prefer them that way. 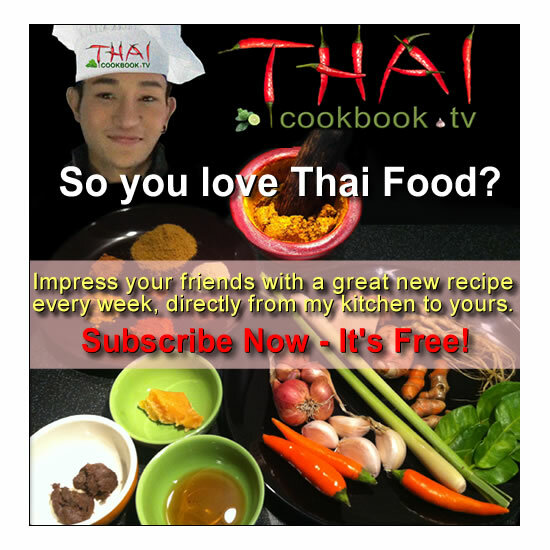 I used about 3 tablespoons of red curry, but you may want to do a test batch the first time and just use 2 tablespoons. Red curry can be a little salty, but these wings should be pungent in flavor and a little salty. The same caution should be said about the ground chili pepper. This is Thai hot chili, which is very spicy on the tongue, but this small amount will only give these wings a hint of spicy. If you use cayenne or another chili, then adjust it according to your own tastes, but keep in mind that these wings are not supposed to be very spicy, as this kills the flavors from the red curry. Whisk together half, or about 1 tablespoon of your curry (saving the rest for later), with the water, oyster sauce, fish sauce, and sugar, and ground chili. Marinate the chicken wings for at least 4 hours. I usually do this the day before and then leave it in the refrigerator overnight. The longer you leave these marinating, the better it will taste. 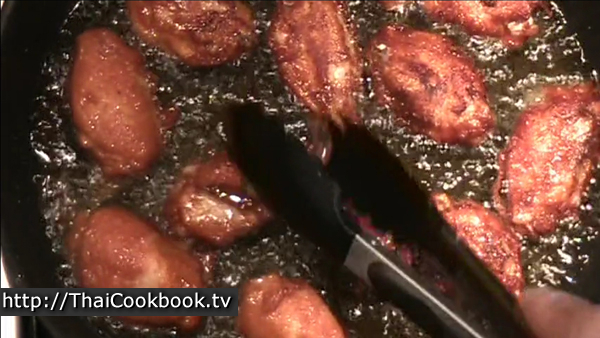 Remove the chicken wings from the marinade and lay them out on a flat pan or tray, saving the leftover marinade. I use what's left to make the batter. With this much chicken you'll probably need about 1 cup of liquid, so I just add another tablespoon of curry and some water to get it back up to the right amount. Whisk it together until it is smooth. Next, add about 1 - 2 tablespoons of flour to the sauce. Whisk it together and add more four until it is a thin batter. Not to thick, as you want the wings to have just a light coating. Think of pancake batter, it should be about like that. Dust a very fine layer of flour on both sides of the wings. Tear the kaffir lime leaves into several pieces each, removing the center stems. If you are using basil, just remove the whole leaves from the stems of the basil plant. Be use the are very dry before you fry them. Use a salad spinner to remove any water, or a paper towel, etc. In a large frying pan or wok over medium flame, heat enough vegetable oil to cover the bottom half of the wings when you lay them in the oil to fry. Add the kaffir lime leaves to the hot oil and fry for a few seconds, until they get a little crispy. Not too much, as they can burn quickly if the oil is too hot. Dip the wings into the batter and let it drip off back into the bowl as much as possible. Add to the hot oil. 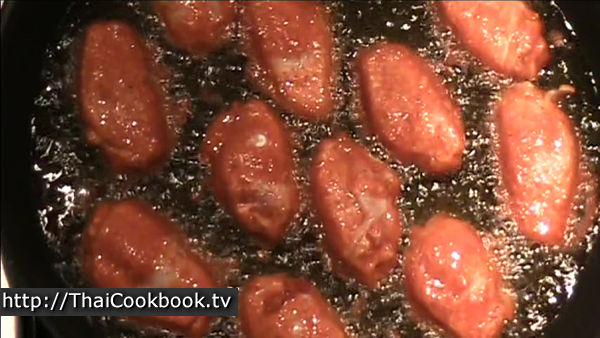 Turn them over only one time, after about 3 - 5 minutes, or when they are a rich reddish brown color on the fried side. Fry again for another 3 minutes or until finished. Remove them from the oil to a cooling rack to drain and cool. Let them cool to room temperature before you stack them on a plate. Note: drumstick sections may take a little longer to cook, so I like to cut the sections and fry them separately. However you do them is fine, but be careful not to burn the wing ends trying to get the drumstick to cook all the way. Serve on one big plate. Garnish with fried kaffir lime or basil leaves.